Several years ago, Denton renovated and preserved this little green house, circa 1850, at the corner of Market and 4th Streets. 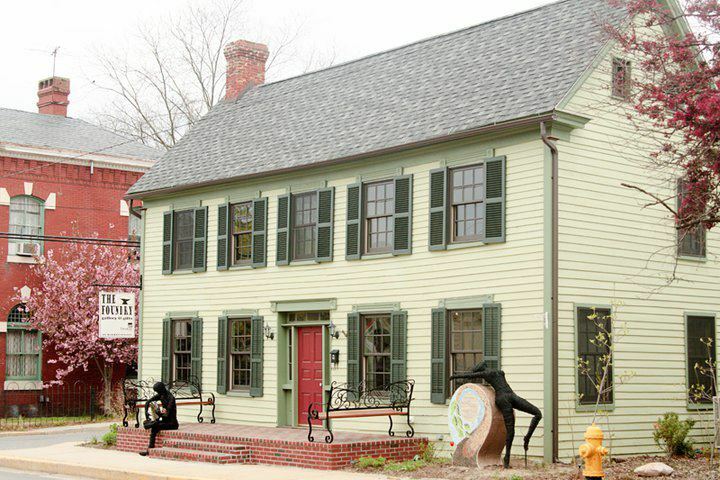 And in doing so, they restored a hunk of historical charm to the main street of Denton. 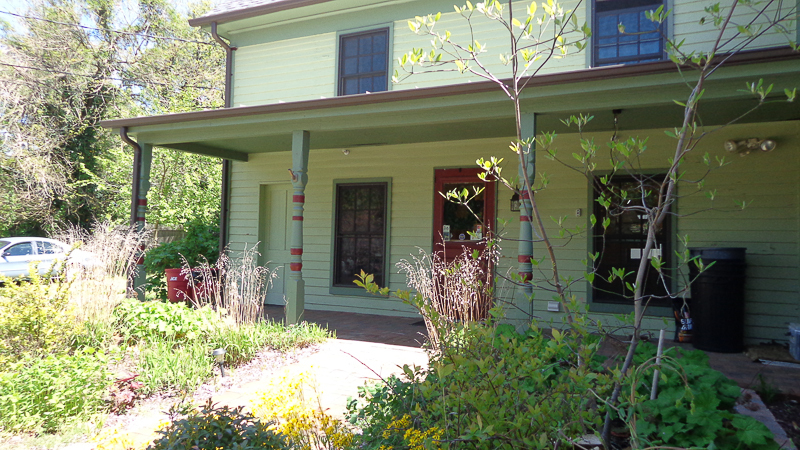 The Foundry, built as a dwelling by a Mr. William Henry Wilson, the owner of a foundry, blacksmith shop, and sawmill, is now home to the Caroline County Council of Arts. 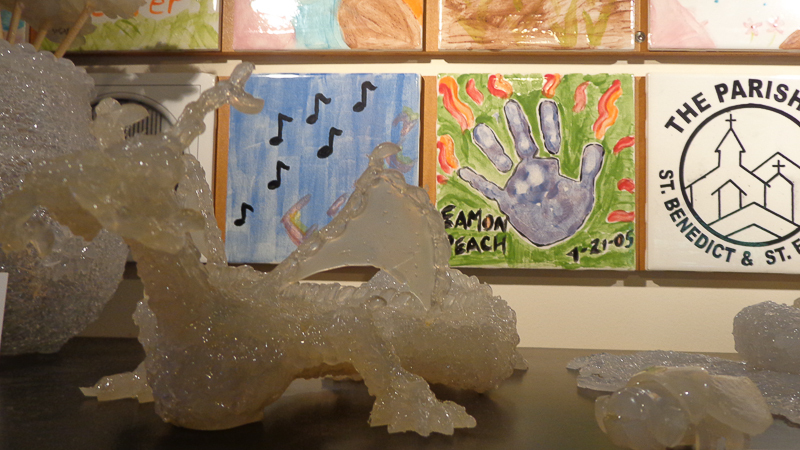 And the art of some 40 county resident artists is on display in the first floor gallery. The Foundry was envisioned as the anchor building for the Artsway in Denton’s historic commercial district. The Artsway project is 4th street’s village of renovated buildings that host artisans and their studios. This village of artists created from derelict buildings that have been restored was the qualifying feature that gained Denton Maryland’s official designations as an Arts and Entertainment District. It’s simultaneously a modest yet grand achievement. 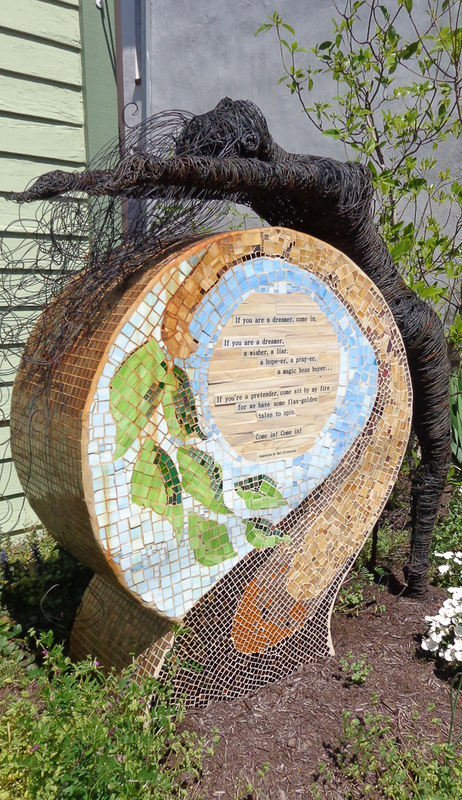 At the front of the house, two wire people, iron sculpture benches, and a mosaic with a befitting quotation, tell you art is important at this address. Walk around to the side entrance and at noon on Wednesday through Saturday, an adorable little old lady will most likely be there to greet you. And you then step into an little old doll’s house. At 5’4”, I’m comfortable with the low ceilings in this petite and quaint abode but a tall man may have do some ducking. The idiosyncrasies of this little old house, painstakingly renovated by Mr. Neil, or Mr. Nail as my kid cleverly calls him, give an extra attitude to the art nestled in the little nooks and hanging from the tilted walls. From the door, turn to the left into the little room at the back of the house where there may be art postcards or locally authored books or quirky little sculptures made of hot glue. At the top of the walls, dozens of tiles affixed like the crown molding were crafted by our community during the annual May arts block party right outside on 4th Street. My son’s tiny hand print is memorialized on one of those tiles. Currently displayed in the entry room are some amazing and substantially sized beautifully carved wooden trunks. You may find stained glass pieces hung in the window with birds and beaches depicted. There may be tiny mixed media collages on the mantelpiece of this fireplace, one of the three in the downstairs rooms. Move into the light filled front room where the old glass pained windows have seen a hundred and sixty years of progress out on Market Street. 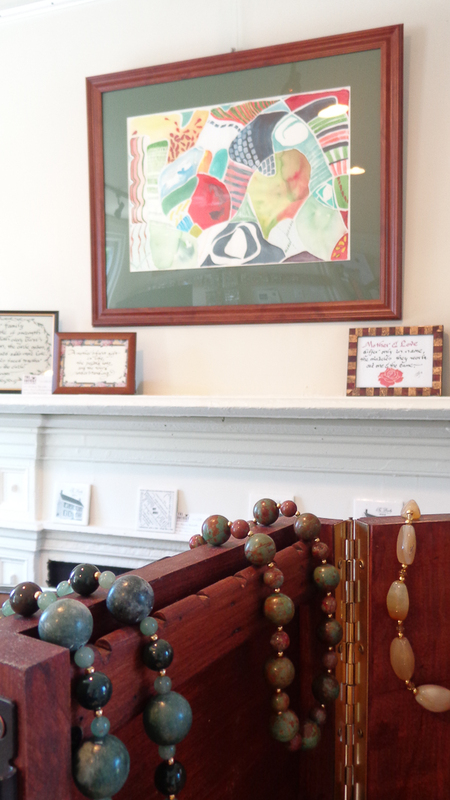 There’s a creak of old wooden floors and the hum of a heater as you walk through taking in a sculpture that leans against the second fireplace or watercolors from Caroline County artists. To the right, past the front door with its beautiful original door lock and handle and old staircase, is one last room full of jewelry displays. Lovely gifts or unique Christmas presents are waiting to be discovered in here. It was in this room that I was once struck by a photograph of a rocket launching from Cape Canaveral as a crane was taking off in flight in the foreground. The Foundry is also host to a series of artist demonstrations every second Saturday of the month from 2pm to 4pm. 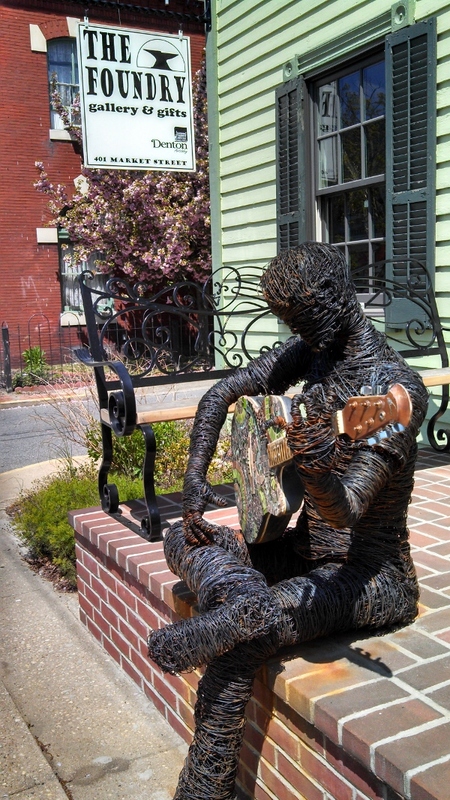 The mix of charming old house, interesting diverse artwork, and artists demonstrating their crafts, makes the Foundry a secret charming find in a backwoods little town. This destination is local and quaint and has a heart comprised from the hard and creative work of many devoted people. Credits: Post written by Shalagh Hogan; Photos by Shalagh Hogan except where noted. Sculptures (wire people) by Danielle Darling. As an artist, Mom, and philosopher, Shalagh Hogan is awestruck and amused by a limitless interest in the ordinary. And the blog at is a playground for her wry sense of humor.